There’s no job too large for these models. 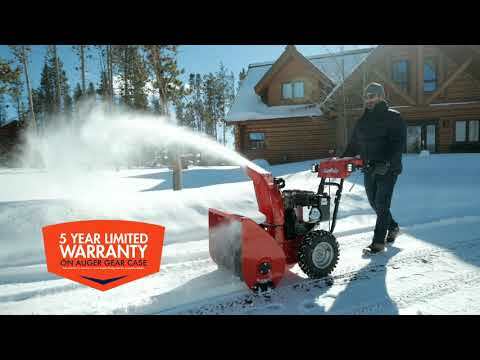 The Signature Pro dual-stage snow blowers have all the features a professional would demand and then some. They feature Briggs & Stratton Professional Series™ OHV engines, integrated channel handles and commercial-grade transmissions. Easily adjusts the chute rotation and deflector angle to provide pin-point accuracy with a simple push of a button. Quickly clears heavy snow and throws it 40% farther¹, making snow removal easier and faster. ¹Time, capacity and snow throwing ability can be greatly affected by conditions (model 2132 compared to model H1730E and model P2132 compared to P2132E). Provides increased visibility by illuminating the path being cleared. Heated hand grips keep your hands warmer on cold winter days. **Capacity and throwing distances can be affected greatly by conditions. ****MAP Price is Market Advertised Price. Prices vary by dealer. Taxes, freight, set-up and delivery not included.